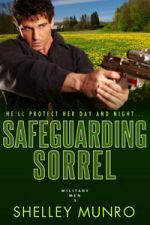 I hadn’t read a military romance for ages but the other day I just had the urge to pull one from my to-read pile. I’m also going through a Western themed splurge so I’m definitely thinking alpha male! Here are some of my favorite reads with military heroes. 1. Cullen’s Bride by Fiona Brand – a Silhouette Intimate Moment by a New Zealand writer. 2. Forget Me Not by Marliss Melton. This is the book I pulled out of my to-read pile. It’s the writer’s first book. Wow! I enjoyed it so much I’ve ordered the rest of her backlist. 3. On Danger’s Edge by Lise Fuller. This book won a RT Reviewer’s choice award. 4. Suzanne Brockmann – It’s hard to choose from Suzanne’s books. One of my all-time favorites is Letters to Kelly. It made me cry. 5. Lora Leigh – I’m a real fan of Lora’s so I’m adding her Navy Seal series to my list. The first book is Dangerous Games. Actually Amazon says this is book 2 so I’m slightly confused. 6. Kiss and Tell by Cherry Adair. I read this book ages ago and have been a Cherry Adair fan ever since. 8. Catherine Mann with her Wingman Warriors. Anything, Anywhere, Anytime is one of her books. 9. Denise Agnew writes great military heroes. Try Primordial. 10. Eye of the Storm by Maura Seger. This is set during the second world war and came out in 1985. I must reread it to see if it’s as good as I remember. Amazon says it’s a civil war story. Wrong, wrong, wrong! 11. All the Queen’s Men by Linda Howard – not strictly military. The hero John Medina is a CIA Black Ops Specialist. 12. Summer in the City of Sails by Shelley Munro – you didn’t think I’d leave out my own did you? :grin: The hero is a member of NZ’s SAS. 13. Unforgettable by Shelley Munro. Go on – buy me! I’ve been getting Five star reviews all over the place! 14. And one extra one – just for Mr. Munro. Any of the Sharpe books by Bernard Cornwell or if you prefer check out the DVD’s featuring the hunky Mr. Sean Bean. One of the recent Sharpe books is Sharpe’s Escape The stories are set in the early 1800’s. The purpose of the meme is to get to know everyone who participates a little bit better every Thursday. Visiting fellow Thirteeners is encouraged! If you participate, leave the link to your Thirteen in others comments. Its easy, and fun! Be sure to update your Thirteen with links that are left for you, as well! I will link to everyone who participates and leaves a link to their 13 things. Trackbacks, pings, comment links accepted!